We’ve said it time and time again, we love horror movies! James Wan is one of our all time favorite horror producers (and writer and director for that matter). When we heard he was returning to produce Annabelle: Creation we were super excited! 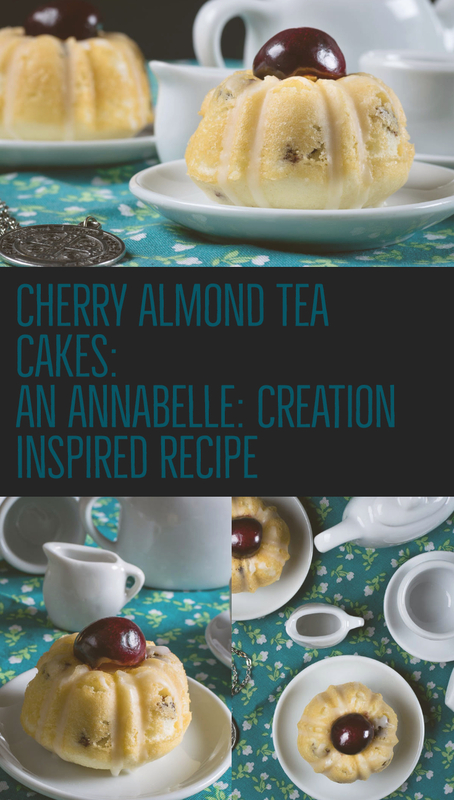 With Annabelle being a possessed doll, we thought what better inspiration for a recipe than a tea party? 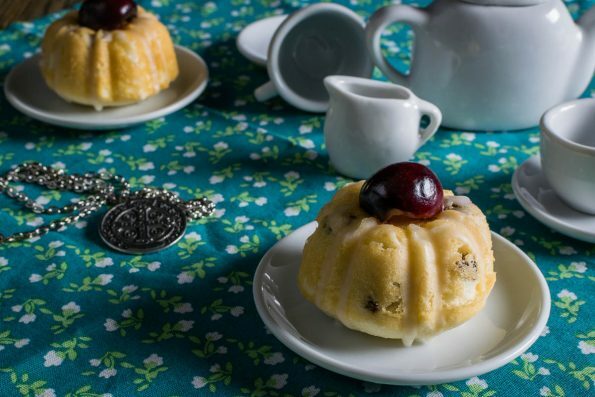 Thus, we are happy to share our Cherry Almond Tea Cakes recipe! As we mentioned earlier, we took a lot of inspiration for this recipe from a child’s tea party. There is a scene in Annabelle: Creation where one of the characters is having one with her dolls. These mini tea cakes are just the right size. No cutting required, just a few deliciously sweet bites. 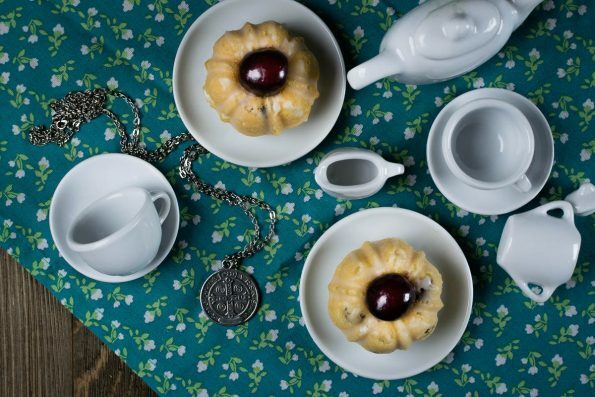 Our tea cakes are sure to please kids and adults alike. Now for the part you’ve been waiting for! 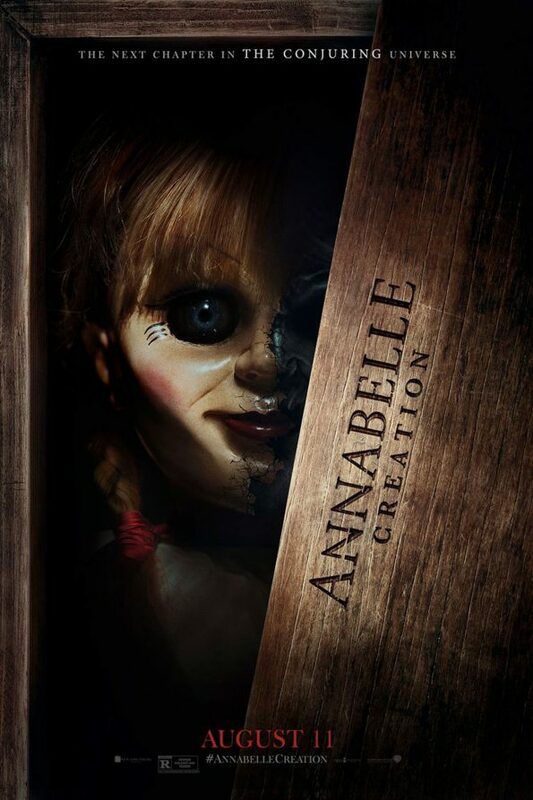 We are giving away five pairs of advanced screening tickets for a sneak preview of Annabelle: Creation! The showing will be held at Harkins Tempe Marketplace on Tuesday, August 8th. The screening starts at 7 pm and the winners should arrive at 6:20 in order to guarantee their seating. Winners will be selected on Monday, August 7th. Good luck! Place all dry ingredients (except dried cherries) in a large mixing bowl and whisk together. Add the wet ingredients and beat on medium speed for 2 minutes. Pour into greased and floured pans, filling each pan a little over half full. Tap cake pans on counter to bring air bubbles to top. Bake for 15-20 minutes (check at 15 minutes). Allow to cool on cooling racks. Mix powdered sugar, vanilla and milk, 1 tbsp at a time, until spreadable (mixture will thicken slightly as it sets). Drizzle icing over each cake and top with a cherry half.